MAD GRACE - selling KEENELAAND APRIL - wins her 2nd in a row! MAD GRACE (English Channel) wins her second straight! TShe sells as hip #30 at the Keeneland April Horses of Racing Age Sale. 1/2 sister to GSW-HENCE, only off the board 1 time in 7 starts. 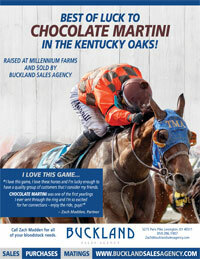 Graded SW and graded stakes-placed CHOCOLATE MARTINI (Broken Vow) is back in the winner's circle and ready for her 2019 campaign. She waited and then split horses to clear for the win racing in allowance company at Oaklawn. The 4-year-old filly is owned by Double Doors Racing, LLC and Nine Thirty Racing LLC and trained by Thomas M. Amoss. 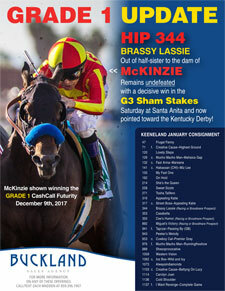 She was sold by Buckland as a yearling for $65,000 at Keeneland September. 3-year-old colt GEMONTEER (Distorted Humor) a FT October graduate, pushed his earnings over $100,000 and added black-type running second in the Showing Up S at Gulfstream West. Racing a mile on the turf he was engaged in one battle or another throughout the race but only lost by half a length. He is owned by Gelfenstein Farm LLC. 2-year-old filly SHESOMAJESTIC (Majesticperfection) broke her maiden at Keeneland in wire to wire fashion - drawing off to an over 4 length victory. She was 2nd in her first start at Churchill. 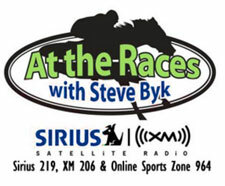 The filly is trained by Chris A. Hartman for Teed Off Stable LLC. SW GERMONTEER (Distorted Humor), a Buckland Fasig Tipton October 2016 graduate, ran 2nd in the Bears Den S at Gulfstream. After leading throughout, he dueled gamely but was overtaken by a closer in deep stretch. The 3-year-old colt won the Not Surprising Stakes at Gulfstream and has 2 wins and 2 seconds in 5 starts. He is owned by Gelfenstein Farm and is trained by Jena M. Antonucci. Tracy. 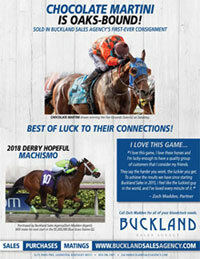 The colt is a BUCKLAND SALES AGENCY grad from the October Fasig Tipton Sale. 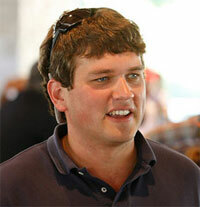 "Zach Madden: AI loved that he breezed a half in the breeze show and bounced out of it well. He will be a very neat horse." Each sales day, we ask one buyer to look at the day's results, and choose the horse he or she thinks was the Buy of the Day. 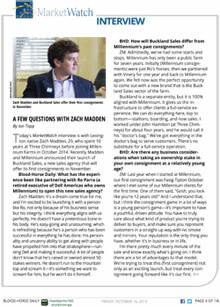 Well-known bloodstock specialist Zach Madden and Ro Parra’s Millennium Farms have partnered to create Buckland Sales, an independent sales agency premiering its first consignments at the November breeding stock sales. 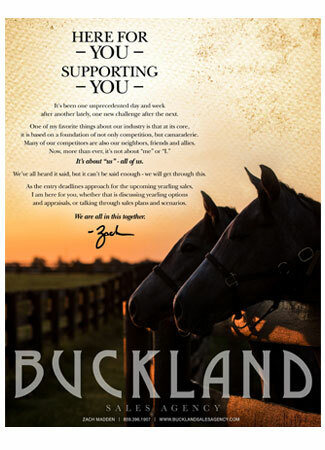 Located in the heart of the Bluegrass on famed Paris Pike, Buckland Sales is working to reinvent the customer service experience for Thoroughbred owners.